The River of Kings has long been one of the most important, if not the most important, waterway in the Land of Smiles. It acts as both transportation and a source of livelihood for many locals. 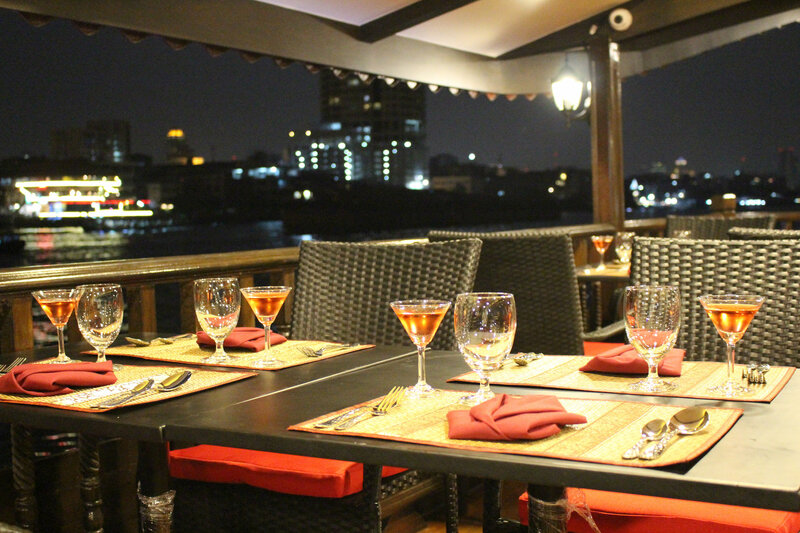 Now, visitors to the Kingdom can experience the Chao Phraya River like never before: aboard a luxurious dinner cruise. Here are our favorites on the Chao Phraya River in Thailand. Supanniga Eating Room has long been a favored restaurant in the capital. Its two locations in the city continue to draw in the most enthusiastic of foodies, and now their delicious menu is available on the water: the Supanniga Dinner Cruise. The boat fits up to 40 people, with two different dining options to choose from, the evening cocktail cruise and the evening champagne cruise. Like its landlocked restaurants, the Supanniga Dinner Cruise is decorated with bright orange, yellow, and blue decor in combination with comfy seating, making it the perfect spot to have a drink on the river at sunset. Cruises range from ฿1,250-3,250 per person, and they normally commence at 4:45 pm. The Chao Phraya Princess Cruise is managed by the Tristar Floating Company. They have been operating since 1990 and run a total of five different cruise experiences. Visitors are sure to have an incredible experience regardless of the one they choose. As diners pass well-known landmarks in the capital, including Wat Pho and the Grand Palace, they will be serenaded by the singers and a saxophonist on board. The two-hour dinner is served buffet style, with international and Thai cuisine to choose from. 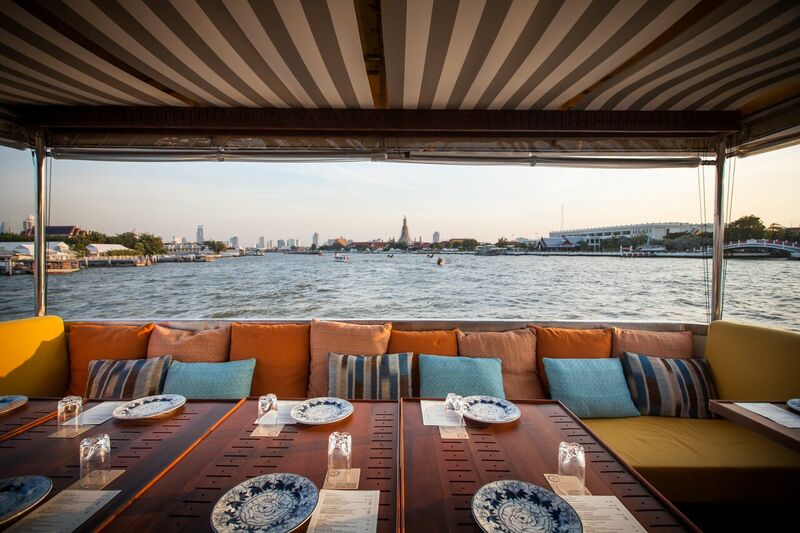 Diners can choose to enjoy their dinner inside where it is cooler or opt for better views and sit on the outdoor deck on the Chao Phraya Princess. Cruises start at 7 pm. Private charters are also available. The Banyan Tree Bangkok is home to some of the best dining options in the capital. From Vertigo and Moon Bar to an all-day international restaurant, there is an eatery for everyone. There is even one that floats down the mighty Chao Phraya River. No detail is overlooked on the Apsara Cruise. 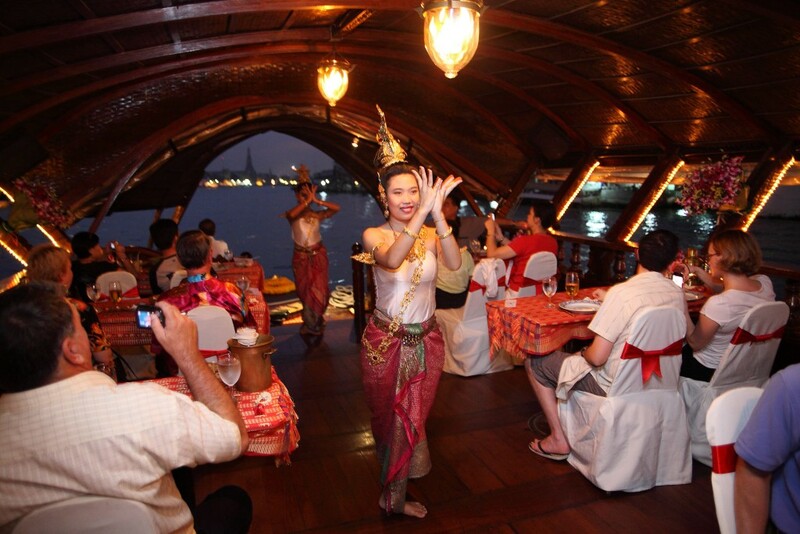 From the attentive staff to the authentic, Thai cuisine, cruises don’t get much better than this. The boat is a vintage rice barge, with intimate seating to provide guests with the most romantic of dining experiences. Be sure to dress to impress, as flip flops and casual wear are not permitted on this luxurious cruise. The cruise starts at 8 pm and ends at 10 pm. The Chao Phraya River seemingly becomes one with the Ganges River for guests on board the Arena River Cruise. 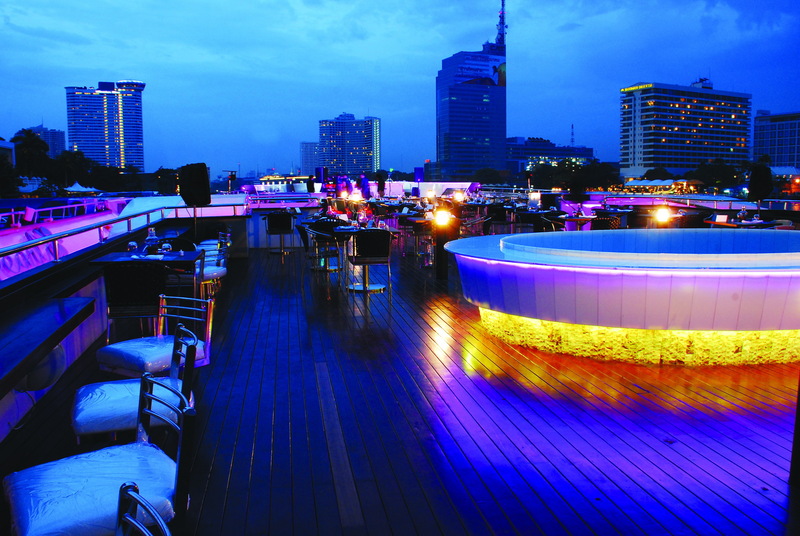 Most of the cruises in Bangkok set sail with only traditional Thai cuisine on deck. This is not the case aboard the Arena River Cruise, equipped with delicious Thai and Indian cuisine, served buffet-style. Some of the delicious Indian menu options guests can expect to chow down on include dal makhani, shahi paneer, and chicken malai tikka, as well as some Thai favorites like the well-known stir-fried chicken with basil. This 2.5-hour long cruise is accompanied by a talented singer, providing entertainment for diners as they voyage down the river. Both dinner cruises and private charters (up to 50 people) are available. Dinner cruises are from 8-10:30 pm. Price per person is ฿1,400, and this includes the Indian buffet, 2.5 hours of cruising along the river, live singing, water, and Indian masala tea. Those looking to cruise down the river on a boat nothing short of luxurious, should dine on the Grand Pearl. This massive ship has three floors, and is even equipped with escalators. Established in 1990, this dining experience has been perfecting both its stunning decor and delicious Thai and western cuisine since. There are a number of unique dining and cruise options to choose from. Those wanting a romantic, candle-lit dinner should check out their Grand Pearl Amazing Dinner Cruise. Those who prefer to spend the entire day exploring via the water may instead opt for the Ayutthaya full-day tour, which allows visitors to see wonderful historic landmarks, including Wat Mahatad. Those hoping for dinner and a show should climb aboard the Loy Nava Dinner Cruise. Traditional Thai dancing is one of the most stunning and graceful art forms in the world. Rarely do visitors to Thailand get to view this type of dance at all, let alone up close and personal. This is not the case on board this particular cruise ship, where diners have the opportunity to watch as performers take over the ship and dance to traditional Thai music. The atmosphere on board pairs perfectly with the authentic Thai cuisine, with local and international favorites including tom yum goong (hot and spicy shrimp soup with coconut). In addition to appetizers, soups, and desserts, the cruise has many meat-free options for vegetarians on board. Bigger is not always better. While many of cruises boast of huge boats, those hoping for a truly intimate dining experience should explore the river on the Manohra Cruises. This boat is mostly made up of wooden decor, with only one deck for passengers. Some of the signature dishes on the menu include massaman kai baan (massaman chicken curry), choo chee pla (fish in red curry), and tom kha kai (Thai coconut soup). These dishes are made to be shared family-style, which is the most popular way to dine in Thailand. The two-hour long cruise commences at 7:30 pm, and it is ฿2,300 for adults and ฿1,400 for children.